The capability and versatility of the musicians who have come together to create OCD is what sets it apart from other entertainment packages on offer. Each individual band member is dedicated to bringing you a standard of entertainment guaranteed to leave you wanting more. 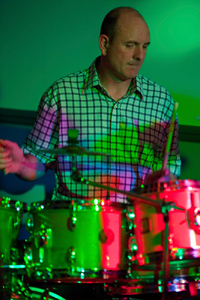 With a professional career in music spanning nearly 40 years, Jakey has bought to OCD"> dynamic flaire and a standard of drumming rarely seen. Originally inspired by early Jazz Funk, Jakeys musical influences came from bands such as 'The Average White Band'. At the age of 12 he was already touring Germany with Chrispian St Peters and by 18 was touring Canada with a ska covers band. Jakeys musical versitility allows him to manouvre comfortable through various styles such as jazz funk, rock, soul, ska right through to country and western. In the times Jakey was not behind a kit he was working behind the scenes as a sound and lighting engineer for bands such as Madness and Imagination and also has a reputation as a sought after DJ performing in numerous venues in and around the UK. Jakeys unconventional style is both visually spectacular and musically inspiring. Since graduating with honours from the Musician's Institute in 1995, Kennie has spent most of his time teaching, song writing and performing. 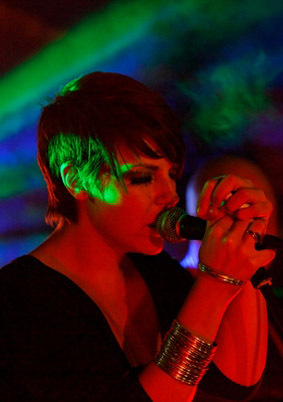 Kennie's diverse musical background spans from playing guitar, bass, flute and singing to creating and mixing electronic dance music and composing and conducting classical music. Kennie brings to OCD the experience of having played bass in nearly every style of popular music imaginable. 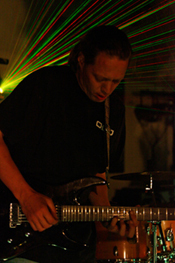 As well as playing in many different function bands over the years, Kennie's previous original projects include funk/rock outfit Raiders of the Lost Groove, psychedelic rockers Many Colours and he is currently working on a new album as the singer and guitarist with jazzy/progressive/grunge band "93 Million". 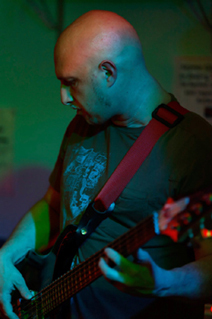 OCDs guitarist and founder member has been involved in and around the business of music for over 30 years. In that time his duties and ventures have spanned a wide range of aspects in the industry from playing guitar and keyboards in various bands and duos to the less glamorous, but equally rewarding, behind the scenes tasks such as recording projects, writing backing tracks, mobile digital recording and more recently the "Guitar Doctor" set up and repair service. Drawing on his fascination and thorough research of nightclubs in the late 80s/early 90s and his love of live music and performance, Mikes ambition was to blend the two genres into an entertainment package that would stand out from the crowd. Though possessing an insatiable appetite for progression, Mike is never happier than amidst a blaze of lasers, strobes and smoke machines, with guitar synth in hand.